When I told my colleague that I was going to cook banana bread waffles for the coming weekend and he was like... Wow! Can I come to your house? Will you do the same too? I know. Just the thought of enjoying crispy and moist banana bread waffles with drizzles of maple syrup will make me salivating instantly... Do you? 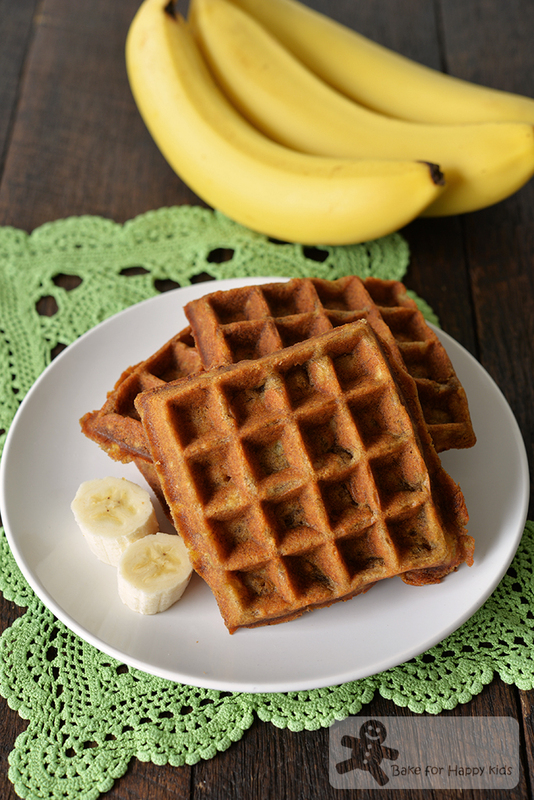 Oopsie if I have influenced you so much that you might be thinking of banana bread waffles right now! LOL! And if you do, you might want to try these two fabulous recipes that I have truly tried and tested. Trust me... They are really really really good. - one tends to be crisper due to the addition of sour cream and egg. - the other one is purely vegan with no eggs added, very banana-loaded and a lot more moister with banana-cake-like inside. I prefer the extra crispy waffles that are made with sour cream and egg but my son said that both are equally delicious in their own unique ways and he can't say that which one is actually better than the other. What to do if you can't decide? Try both recipes!!! Both are going to be delicious so it's a win-win situation. LOL! These are the crisper ones with sour cream and egg. - contains sour cream which makes the waffles extra crispy and moist. - contains baking powder to create extra raising power. - contains egg which is an essential ingredient to make crispy waffles. - contains no eggs and any dairy products. - contains an extra 20ml (about 1 1/2 tbsp) vegetable oil which is an essential extra to make the eggless waffles crispy. - contains an extra 60ml (1/4 cup) mashed banana to bind the batter together. - contain more baking soda but no baking powder so that the baking soda can react with slightly acidic banana to create good waffles raising power. And everything else in both recipes are the same. 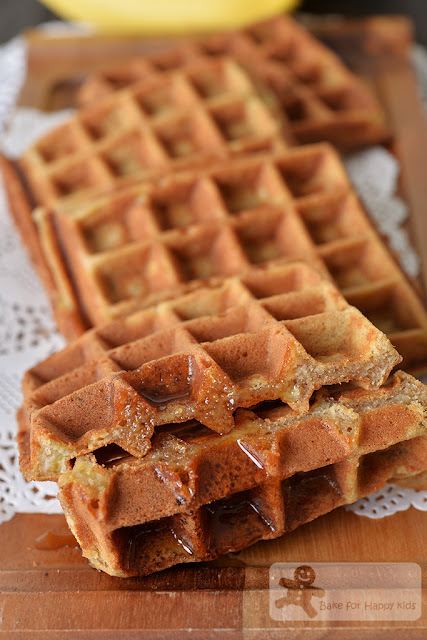 And essentially, each of both recipes must contain two tablespoons of brown sugar and contains two tablespoons of demerara (or coarse white or caster sugar) because the brown sugar will make the banana bread waffle bodies extra moist and flavoursome and the demerara (or coarse white or caster) sugar will crisp up the waffles exterior. So, please do not substitute or reduce any of these ingredients. Crispy banana bread waffles drenched with maple syrup!!! Must cook these waffles? No worries because cooking these waffles is easy!!! Just measure, mix, cook and enjoy! Here's a video showing how I made the waffles using recipe one. Very banana-loaded and very yummy!!! These are crispy too but moister with thicker cake-like body. 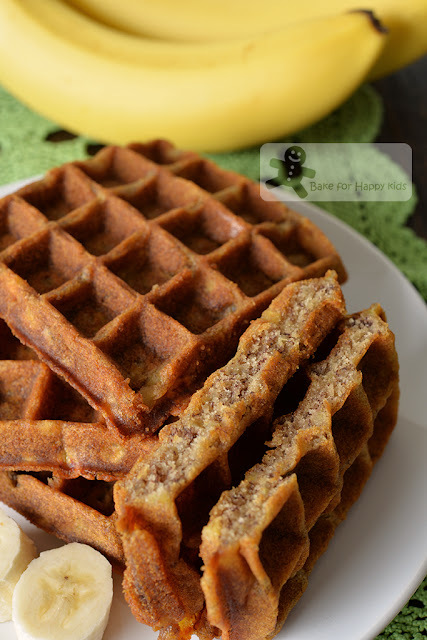 Cooking these vegan waffles are easy too!!! Here's a video showing how I made the waffles using recipe two. Here are the recipes that are inspired from Food Network at here and here and also here. In a large mixing bowl, mix mashed banana and both sugars with use a fork to mix until the sugars are incorporated. Then, add vegetable oil, sour cream (recipe one only), vanilla and egg (recipe one only) into the banana mixture and use a fork to mix briefly until combined. Add the dry ingredients into the banana mixture and use the same fork to mix until just combined. Do not over mix and it is ok if the mixture is lumpy. Spray preheated waffle iron with vegetable oil spray. Caution: If you are cooking waffles on the your stove, please do not spray cooking oil into direct fire! 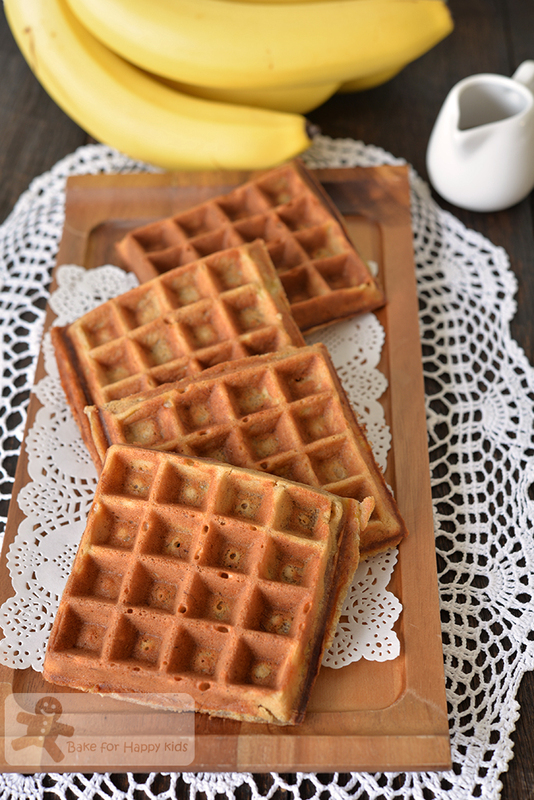 Pour adequate waffle batter (about 1/3 cup to 1/2 cup) onto hot waffle iron. Important note: 1) The batter made from recipe one tends to have more chemical reaction and there might be excess batter flowing out of the waffle iron during cooking. 2) The batter made from recipe two is thicker and won't create a lot of chemical reaction. Cook until both sides are crispy and golden. 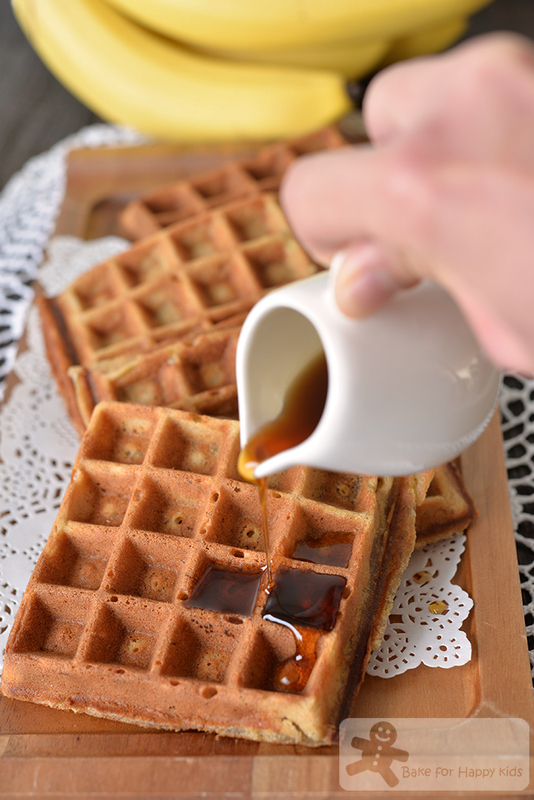 Remove waffles out from the iron very carefully as these freshly cooked waffles can be a little soft at first and need to cool slightly to firm up their exterior structure further. Repeat this step until all the batter has been used. Serve immediately or if you want the waffles to be crisper, place them on a wire rack, then into a 100°C or 200°F oven for about 10 mins or more until ready to serve. Dust with icing sugar if desired and serve with any syrup or fruits that you like. you are making me regret giving my waffle maker to my sister!, these look so yummy! Hope that you will like the recipes. Enjoy!